I got a new phone last night and I am so freaking excited about it. I have dropped my old phone so many times, it is amazing that it still works. Well, it’s not that amazing, I suppose, because it *barely* works. But now that I have a RAZR M (it was free! ), I don’t have to worry about that anymore. I also have a sweet purple case for it. So I have to tell you about Verizon. I have been with Verizon for 13+ years. I am sure other carriers are just as great, and maybe better (though I doubt it, haha), but Verizon has been great to me over the years. Yeah, the prices go up, they charge an arm and a leg for everything, but ALL companies do. Also, I calculated it out, and on our family plan, we pay about $55/mo per device (total bill after tax divided by number of devices), and that’s not too shabby. That all being said, the point of me starting this rant, was to say that Verizon apparently buys back your old device now, and the buy-back goes to off-set the cost of the new phone, bundle, etc. What do they do with the old device, you ask? They donate it to domestic violence shelters to give to victims of abuse, in order to have a phone for 911 calls that is hidden from the abuser. Or, they ship them overseas and sell them at extremely discounted prices to those that are less fortunate. HOW AWESOME IS THAT. Years ago, when I was an undergraduate social work student, I held several informal cell phone drives, collecting cell phones in order to give them to the Snohomish County Center for Battered Women. I believe I collected 10+ phones total, all of which went to an amazing cause. And now Verizon is on the bandwagon with that. Ok, so let’s go back to food. Specifically these yummy burgers. They are delish. My husband was in a “Can we please eat American food for once?” phase, and this was the next meal on the plan (from last week). Yeah…it’s not American. But it’s a burger, and that sort of counts, right? We both loved them. -Combine the chicken, soy sauce, peanuts panko, cilantro, scallions, garlic, crushed red pepper, lemon zest and juice in a bowl. -Using your hands, form 4 evenly shaped rectangular patties. Place on a plate, cover, and let them sit in the fridge for about an hour. -Heat an indoor or outdoor grill over medium high. Lightly coat with oil or cooking spray and grill the patties until cooked through with nice grill marks on both sides, 10 minutes total (we have yet to use oil on our grill, but every recipe has turned out well anyway). -Brush ciabatta buns with oil and toast or grill 2 minutes. 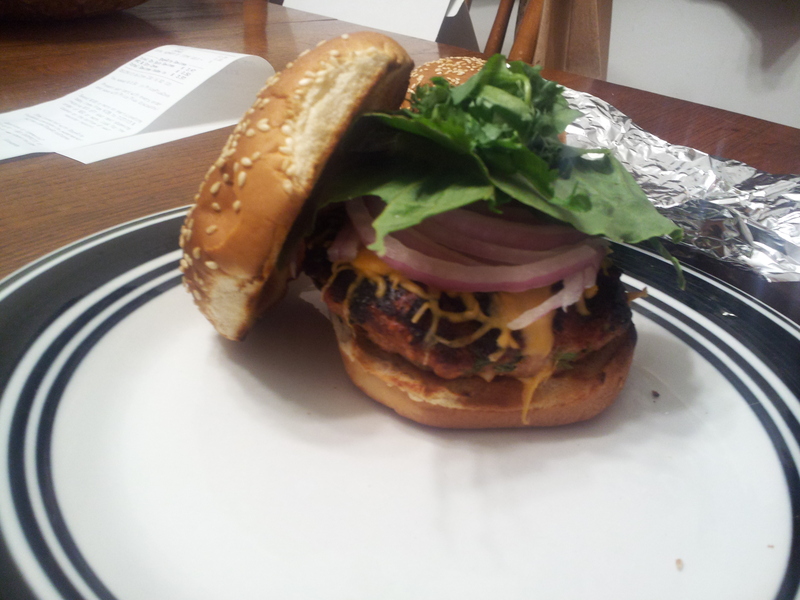 -Serve burgers garnished with cilantro, radishes and a good drizzle of the sweet chili sauce. -I garnished ours also with red onion and lettuce!